Superior ergonomics and ambidextrous controls. Superior ergonomics and ambidextrous controls. Built to Military and Police standards. The folks at Smith & Wesson have been making high-quality firearms since 1852, and they've never stopped innovating. The M&P22 is another notch in that legendary belt, with low-profile sights ideal for holstering and drawing, durable metal frame aluminum-aerospace alloy slide and plenty more. 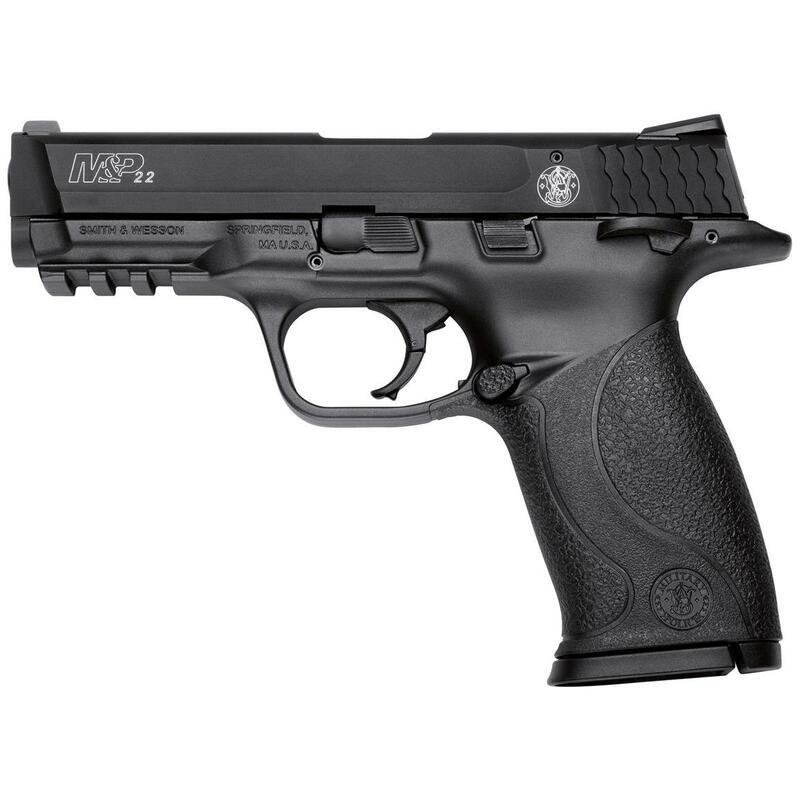 Smith & Wesson designed the M&P series for Military and Police applications, so you can rest easy knowing it's reliable for home protection and professional duty. 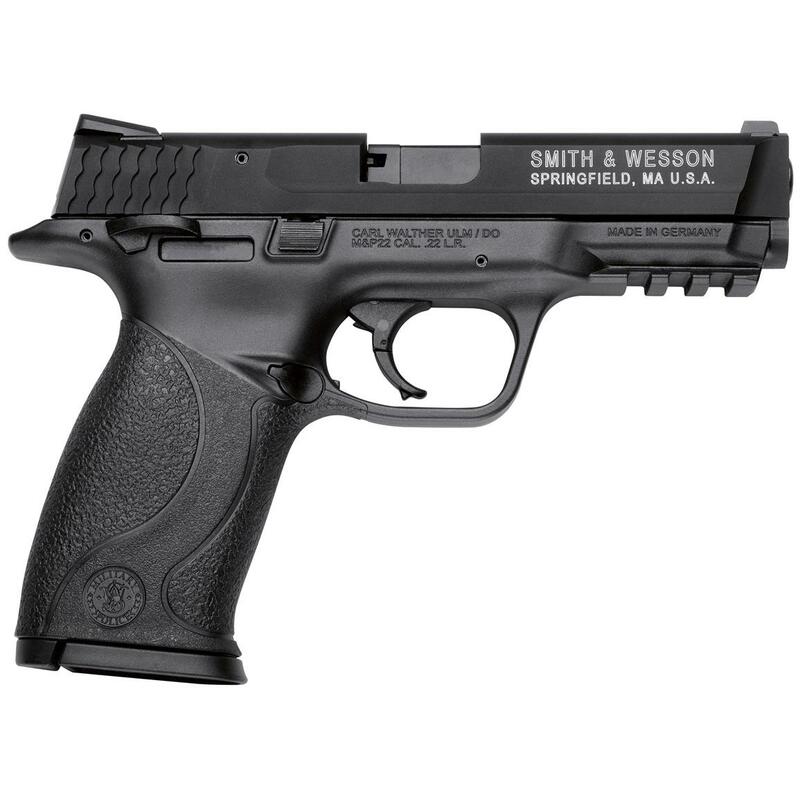 Smith Wesson M P22, Semi-Automatic, .22LR, 4.1 Threaded Barrel, 12+1 Rounds is rated 4.4 out of 5 by 8. Rated 4 out of 5 by scuba from smooth, reliable. smooth operation, easy take down.very lightweight and looks great! Rated 5 out of 5 by Digdug from Great gun for the price I have one of these and love it. Trigger is good. Better that ruger mark 3. Barrel is threaded which works great for my suppressor. Rated 5 out of 5 by BobSME from Walther clone The insides are the same as the Walther PPQ M2 .22 lr I used to own. Only differences are exterior. Came with a threaded barrel, which is not mentioned in the owner's manual. Does have a bushing wrench. You need to purchase an aftermarket barrel bushing to utilize the feature. Very nice trigger, similar to the PPQ. Fed most brands of ammo I tried, except for Federal Auto Match, for some reason. All in all a great 22 pistol. Rated 5 out of 5 by BJT1 from GREAT FIREARM!! This is a great pistol that operates and shoots perfectly. The full size makes it perfect for training and fun. Rated 5 out of 5 by Scott from Great .22 Trainer I have had this firearm for over a year and it's a great trainer if you own a full-sized M&P handgun. Mine has functioned flawlessly and I have no complaints whatsoever. Rated 5 out of 5 by COPMAN from S&W M&P22 I purchase the m&p 22 unknown about its performance? I shot the weapon and let two other people fire it for their review, l was very impressed with handling,accuracy and performance, As the others who shot it. I own and shoot several other name brand 22lr handguns and can say this is a pistol I and you will not regret buying. Also the sportsmanship guide was the best price anywhere I checked. Rated 1 out of 5 by JFA23 from Not a very good gun This is made by Walthers and has a history of being ammo sensitive like the Sig Mosquito. It is too big for a 22 and a better choice is the M&P 22 Compact, made by S&W.